The March 2019 issue of Construction & Housing Review is now available in the Dodge Analytics Store! 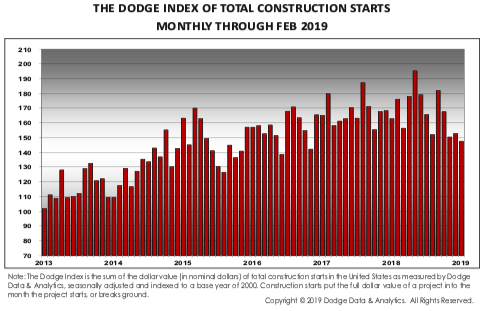 Construction and Housing Review is a monthly publication reviewing the most recent month’s U.S. construction activity at the national and four-region levels. In addition, the Review provides monthly updates of major economic indicators from a variety of other sources, including the U.S. Census, and ENR, and the U.S Bureau of Labor Statistics. For many more market tracking and forecasts covering the construction industry by state and MSA, visit the Dodge Analytics Store Homepage!